You are here: Home / Communication / News / Visit our members in BAUMA! 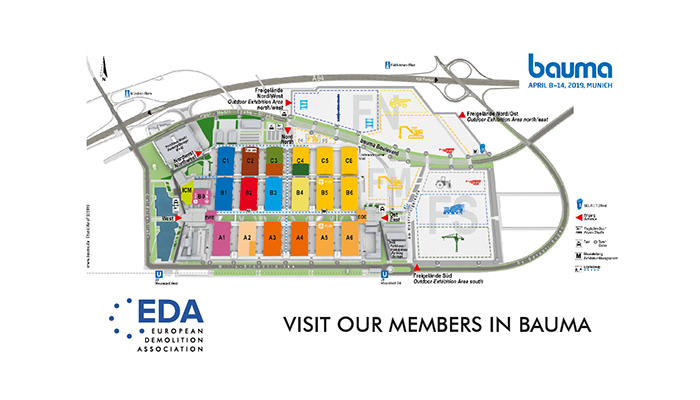 Visit our members in BAUMA! BAUMA 2019 is almost here and no one wants to miss it! If you are going to attend, stop by the booth of our members to know the novelties prepared for the world’s leading construction machinery trade fair. https://www.europeandemolition.org/cms/files/EDA_Bauma_Map.jpg 400 700 Communication RABUSO https://www.europeandemolition.org/cms/files/EDA_Logo_40_anniversary_color_rgb.png Communication RABUSO2019-03-22 15:04:242019-04-11 10:27:08Visit our members in BAUMA!